I’ve been dreaming up these crispy baked chili shrimp for years because these shrimp are loosely inspired by the most delicious crispy shrimp at my favourite sushi spot in Toronto. The crispy shrimp at that restaurant are deep-fried and battered, but I wanted to try and recreate them in a more home-cook friendly sort of way. So, I’ve cracked the code and have developed this simple very simple and quick “at-home” version for you today. The dish that inspired these shrimp isn’t made with chili and lime (chili and lime isn’t really a common flavour pairing in Japanese cuisine), but this is one of my favourite, go-to flavour combinations and I thought you’d like it too. Also, it was what I was craving at the time, and this is my blog, so voila! I seem to have acquired this strange writing block; whenever I sit down to write a blog post, I end up sitting here for a couple of hours just thinking about what I’m going to write instead of actually writing it. It’s completely counter-productive and it is driving me crazy. I think this is something that has developed and become a bit more of an issue as I’ve gone along on this blogging journey. I used to be able to bang out a post in 20 minutes, not because I was writing crappy posts, but because it came a bit easier back then. But I think that as I’ve begun to share more parts of myself on here and realized that you or him or her is out there reading, there is just a little bit more pressure. I do my best not to think about it while I’m writing, but sometimes I just can’t help it and find myself completely blocked. Since I can’t really think of much else to talk about, let’s talk a bit about this recipe. Since these shrimp are baked and not fried, I opted to use Panko breadcrumbs because I think they give the shrimp a little extra crispy element that you wouldn’t get otherwise. This recipe may seem a little intimidating, but you make these shrimp the same way you would make chicken fingers, first dredging in flour, then into egg and finally into a breadcrumb-spice mixture. I’m on reading week next week, and I’m going to try and take a bit of a break and see if I can write my way through this block. Not sure how that’s going to go, but I will report back. In the meantime, this simple crispy chili baked shrimp is ready for you! Baked and not fried, this healthy crispy shrimp recipe combines chili and lime into a perfect, kid-friendly dinner or appetizer. Preheat oven to 475F. Grease a baking sheet with 1 tbsp olive oil. Season shrimp with salt. Add flour to a medium bowl, set aside. In another medium bowl, whisk together eggs and set aside. Finally, in another medium bowl combine panko, chili powder and smoked paprika. Bread shrimp: Toss in flour. Then, with 3 or 4 shrimp at a time, shake off the excess flour. Coat with egg, shaking off the excess and dredge in panko. Transfer to baking sheet. Brush shrimp with remaining tbsp. of olive oil. Bake for 12 minutes, flipping once halfway through. 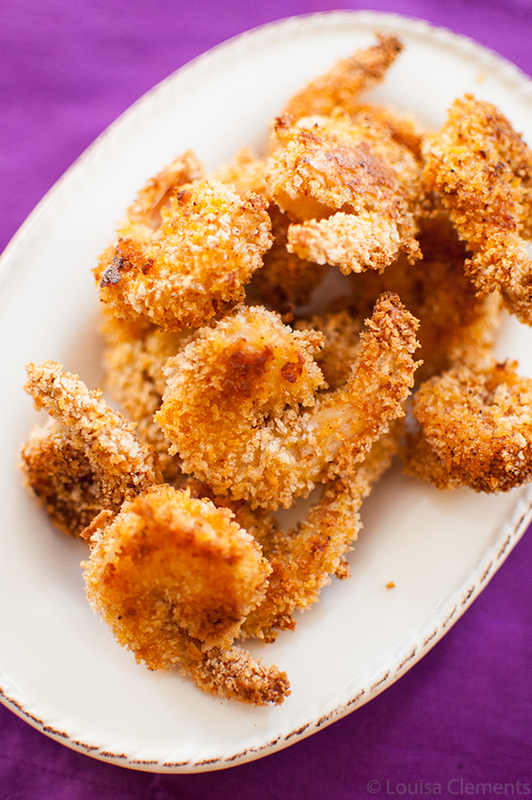 These crispy shrimp would make a great main for dinner (I think kids would especially like them) but you could also serve them as an appetizer. This look so tasty, I love a bit of spice in my food. Thanks Ayngelina, me too! Let me know if you give them a try. Thank you, the panko adds such a nice crunch! These look amazing. Will be trying soon! Thanks, Ceecee! Let me know if you give them a try. Great recipe. I love the fact that the prawns are baked and not deep-fried. Will be making this soon. Thanks, Pina! Let me know how it goes. Aw, hon... first off hugs. You're not alone when it comes to writers block and it can be rough to get over. Just keep writing and cooking and it will all fall back into place. Meanwhile, those shrimp look ah-mazing... I want to lick my screen! What an interesting recipe! I love the results!